Natural hyperbolic materials. The hyperbolic frequency ranges of the transition metal dichalcogenides (TMDs) investigated in this work. The hyperbolic dispersion of the TMDs is predominantly Type II (blue) corresponding to metallic response in-plane and dielectric response out-of-plane. Electromagnetic metamaterials are artificially created, structured materials with unique optical properties. In contrast to ordinary materials, the electromagnetic properties of a metamaterial do not arise only due to the composition but also because of the underlying structure of the designed subwavelength building blocks. In particular, hyperbolic metamaterials (HMM) have emerged as one of the most important metamaterials. The characteristic property of a HMM is that it has dielectric properties (ε>0) in one direction and metallic properties (ε < 0) in two orthogonal directions. The solution of Maxwell’s equation in such a dielectric medium yields waves with hyperbolic rather than spherical/ellipsoidal isofrequency surfaces in reciprocal space. In principle, a hyperbolic dispersion implies high photonic density of states over a large range of frequencies leading to high Purcell effects allowing for radiative decay engineering useful for applications such as single-photon light sources. For a long time it was believed that materials with such extreme anisotropy do not exist in nature. Instead they were realized by stacking alternating layers of metal films and dielectrics to form a superlattice with lattice parameter, a in the range 10-50 nm. In practice, however, the finite layer thickness implies that only waves of wave length much smaller than layer thickness a will behave as hyperbolic modes, and this has precluded essentially any envisioned application. 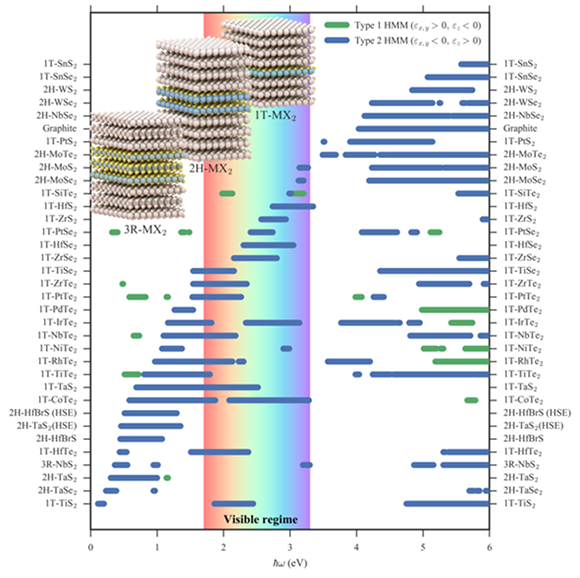 In a recent work Kristian Thygesen and co-workers have demonstrated, using first-principles calculations, that the broad class of layered transition metal dichalcogenides (TMDs) are naturally hyperbolic. The diverse electronic properties of the TMDs result in a large variation of the hyperbolic frequency regimes ranging from the near-IR to the UV, see figure. Moreover, compared to artificially structured metamaterials, the absence of internal structure reduces scattering losses and greatly increases the number of hyperbolic modes and thereby overcoming many of the drawbacks of the artificial metamaterials. The authors further show that the hyperbolic dispersion can be controlled by combining different two-dimensional crystals into van der Waals heterostructures opening up radically new opportunities for controlling light-matter interactions.